I’ve been having issues with Aptana putting a huge black box over the code window on Vista 64. And it seems many others are having the same issue as well, which is a shame because it’s an otherwise great program. It appears to have something to do with the preview tabs. I could open up as many PHP pages as I wanted and not have any issues, but as soon as I opened up a CSS file all of the tabs started acting up. Since I don’t really need to preview CSS inside Aptana I tried disabling preview for CSS and it worked. No more black box, no more issues on the other file types. 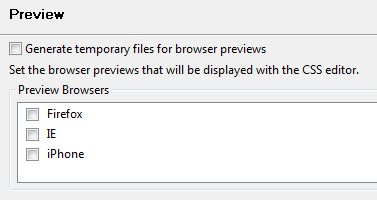 Go to Window -> Preferences and then click on Aptana -> Editors -> CSS -> Preview and clear the Generated temporary files for browser previews and any checkboxes under Preview Browsers. I had 3 – Firefox, IE, and iPhone. Maybe a little too soon. I’m getting forbidden errors trying to add the PHP plugin.